How many hands-on computer training classes have you attended where everyone starts at the same skill level, progresses through the material at the same pace and ends up knowing everything they came there to learn? This is why That CAD Girl recommends that all hands-on CAD training be custom designed. Custom Training is usually a better value than traditional classroom training because focusing ONLY on the topics you need to cover requires a fraction of the time. 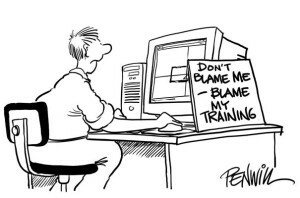 Less time in training means more time using that software to make money! That CAD Girl can create a custom training plan that covers features of IntelliCAD, AutoCAD or most Carlson Software office & field software programs. Training can be customized for one person or several people using our datasets or your projects so you get as much value as possible for your investment in training. We can hold the training at your location, at ours or online. Have a last-minute training request? Don’t have time for travel? Online training is quickly becoming the most popular form of training that we offer. Why? One reason is the immediate nature of it. Assume you are working on a project and just can’t get your profiles to draw the way you need them to. In many cases we can schedule an online training class with only a few hours’ notice.